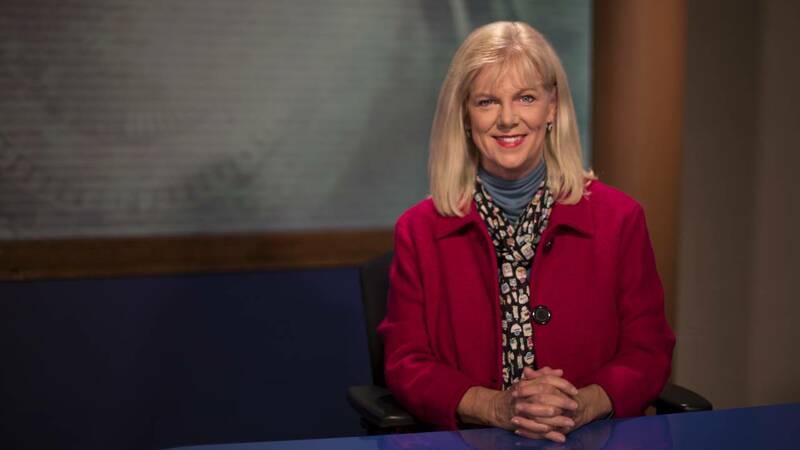 Lis Exon, segement producer and journalist for OETA in Tulsa, is one of nine outstanding journalists who will be honored during the 47th anniversary induction ceremonies of the Oklahoma Journalism Hall of Fame April 27 at the University of Central Oklahoma in Edmond. Other honorees include James Beaty, managing editor of the McAlester News-Capital; Steve Booher, retired general manager of the Cherokee Messenger and Republican; John Durkee, news director for the University of Tulsa’s NPR station, KWGS; Carla Hinton, religion editor for The Oklahoman; Randy Krehbiel, government reporter for the Tulsa World; Dr. Paul R. Lehman, first African American newsperson in Oklahoma City television; Ralph Schaefer, editor of suburban Tulsa newspapers; and Gene Triplett, retired news and entertainment journalist for The Oklahoman. Exon has served as producer, reporter and anchor at OETA in Tulsa since 2006. Beginning as reporter and anchor for KXXO and KELI radio in Tulsa, she has worked as a television reporter, producer and anchor, including KJRH in Tulsa, WESH in Orlando, KUSA in Denver and KTRK in Houston, and reported for CNN, NBC and ABC. Awards dominate her work: IRE for a series leading to federal indictments and convictions of state Senate President Finis Smith and wife; the Texas Governor’s Award for an investigation leading to the passage of laws reforming the parole process. Oklahoma SPJ twice honored Exon as having the Best Reporter Portfolio. In 2015 she received the “The Colby Award” for reporting on mental health issues. In 2016, Exon received the most awards for individual stories from SPJ, including five first places. She earned a broadcast journalism degree from the University of Tulsa in 1978. The luncheon program begins at 11:45 a.m. on the third floor of the Nigh University Center, across from the Hall of Fame exhibition, said Dr. Terry M. Clark, director. Master of ceremonies will be Mark Thomas, executive vice-president of the Oklahoma Press Association. More than 200 journalists, friends and families are expected for the Hall of Fame. UCO President Dr. Don Betz will welcome the crowd. “The annual ceremony has become an informal homecoming for honorees and families. The Hall is a virtual Who’s Who of Oklahoma Journalism, and the crowd will be filled with the giants of the profession,” Clark said. After 20 years as director of the Hall, Clark announced his retirement from UCO, and the appointment of Joe Hight as director beginning May 1. “I’m excited and pleased that a journalist and Hall of Fame member of Joe’s stature has agreed to take over,” Clark said. “It’s time for new blood to lead the Hall as it approaches its 50th anniversary and some challenges. His journalistic and management experience will serve the Hall well.” Hight also serves as the Edith Kinney Gaylord Chair of Journalism Ethics at the UCO Department of Mass Communication. Also to be honored are three UCO journalist students, recipients of the Brian J. Walke ethics scholarship and the OPA Award for outstanding promise in newspaper journalism. Deadline for reservations is April 20. Invitations are in the mail, and luncheon reservations are available for $20 a person by mailing checks to his attention, payable to UCO, 100 N. University Drive, Edmond, OK 73034. For those who register and pay in advance, there will be no standing in line. Inquiries are welcome at tclark@uco.edu or 405-974-5122. Honorees are selected by a committee composed of members of the working press and the Hall of Fame. The committee sifts through all nominations, both new ones and those held over from previous years before selecting the honorees. Nomination forms are available at any time Hall of Fame, or online at the website, http://okjournalism.uco.edu/. Framed citations are on display in the Hall of Fame in the Nigh University Center at the University of Central Oklahoma. The UCO Department of Mass Communication is the host and administrator of the Hall. The Hall of Fame was founded in 1971 by former Journalism Chairman Dr. Ray Tassin. This year’s inductees make 418 total members, all of whom are carried on the website. The Hall is supported with funding from UCO.